Grapefruit is a citrus fruit with a slightly bitter and mildly acidic or sour taste. For some people, it may not please the taste buds, but it is power packed with vitamins, minerals and disease-fighting plant compounds that provide us with unexpected health benefits. Grapefruit is an amazing fruit for dieters and weight-watchers. It aids weight loss by enhancing the satiety and by delaying the onset of hunger pangs. The high fiber content of grapefruit increases digestion time and delays gastric emptying, thus, providing a feeling of fullness. On digestion, dietary fiber draws in water and swells. Hence, a person feels full for a longer period of time after eating fiber-rich foods like grapefruit. One interesting study found that individuals who ate half of a fresh grapefruit before meals for 12 weeks resulted in significant weight loss. Besides this, a drop in the waist circumference and waist-to-hip ratio was observed in regular grapefruit eaters. Another important feature of grapefruit that has known to help in weight loss is its high water and low-calorie content. Hence, fewer calories enter your body even when you eat a large portion of grapefruit. The low glycemic index of grapefruit has made it a popular fruit among the diabetes-control diet. With a glycemic index of 25, a grapefruit is an amazing option for individuals with diabetes mellitus because it does not shoot up the blood glucose levels quickly as compared to high glycemic index fruits. The dietary fiber present in this fruit further slows down the conversion of carbohydrates to glucose and thus prevents a sudden spike in the blood glucose levels. Plant compounds present in grapefruit reduce insulin resistance and make the cells more sensitive to insulin. Hence, eating half a grapefruit before meals may help in the better management of diabetes mellitus. Grapefruit possesses anti-hyperlipidemic activity due to phytochemicals and other essential nutrients in it. Naringin a flavonoid present in grapefruit inhibits the activity of an enzyme HMG Co-A reductase and thus, blocks the production of cholesterol in the body. The lipid-lowering ability of grapefruit is due to its high pectin content. Pectin is a soluble fiber that traps the bile salts and prevents their reabsorption. It further stimulates the excretion of bile salts in the feces. Hence, cholesterol stored in the body is used to produce bile salts, which are then required for the digestion of fat. Scientific studies have reported that consuming citrus fruits regularly may decrease the risk of cardiovascular diseases and stroke. Grapefruit is a citrus fruit that holds heart protective plant chemicals and naringin is the chief flavonoid in grapefruit that boosts heart health. First, these plant compounds inhibit the formation of a clot in the arteries and enhance smooth blood flow all throughout the body. Hence, these compounds eliminate unnecessary pressure on the heart. Second, antioxidants in grapefruit prevent oxidation of LDL as well as initiation and progression of atherosclerosis. 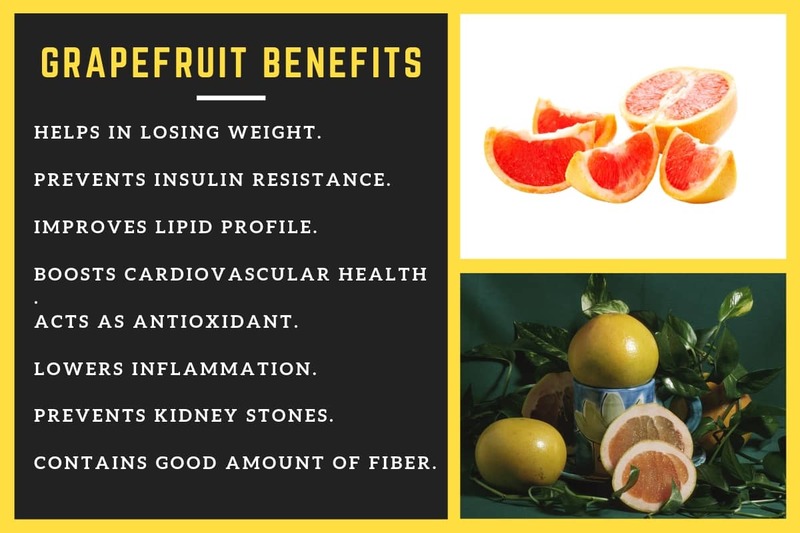 Third, key nutrients present in grapefruit like potassium, strengthen the heart muscle as well as lower blood pressure in individuals with hypertension. Research has noticed that flavonoids present in grapefruit peels and flesh possess strong antioxidant activity. Naringin, a chief flavonoid in grapefruit shows robust ability to scavenge free radicals and it acts as a powerful antioxidant. So, the intake of grapefruit on a regular basis may help in reducing the burden of oxidative stress-induced degenerative diseases and disorders. Vitamin C, beta-carotene and lycopene present in grapefruit are the three notable scavengers of toxic radicals. These compounds boost overall health by protecting each healthy cell against attack by harmful free radicals. Grapefruit may be helpful in the treatment of certain diseases and disorders where pro-inflammatory compounds play a contributing role. Research has indicated the beneficial impact of grapefruit consumption on inflammatory bowel disease (IBD), a chronic inflammatory disease that affects the lining of the digestive tract. The flavonoids present in grapefruit lessen the harmful effects of free radicals, which otherwise amplify inflammatory reactions. These flavonoids also enhance the natural antioxidant defense system of the body, which in turn protect the cells of the digestive tract against inflammation and damage. Grapefruit flavonoids further block the inflammatory pathway and suppress the production of inflammatory compounds. Scientific studies have found that citrus fruit juices like grapefruit juice could represent a natural alternative to potassium citrate, a drug used to treat kidney stones. Citric acid present in this fruit may reduce the risk of kidney stone formation by flushing the stones out of the body. Eating this low-calorie, nutrient dense fruit on a regular basis is an easy and convenient way to add plenty of health-boosting nutrients and natural compounds. Just keep in mind the best time to eat grapefruit is before the meals. How to Eat a Grapefruit?